Pricing listed here is for US customers. Pricing varies per region. Connect everything. Report on anything. Connect your accounting, inventory, sales, human resources and marketing systems to Wink Reports. Once all of your software is connected you can see how marketing spend is paying off in traffic to your website, leads in your CRM, sales in your POS, or jobs in ServiceM8 all on one report! Access your business data live in customised reports that are automatically delivered to your email, or viewed on your computer, tablet or phone. Pros: Very impressed with Wink Reports everything they have done for my company. They have amazing custom software with highly skilled programmers that can and will make running your business much more efficient and profitable. Pros: Only software I have found that pulls live data from a field service and acccounting program. Very customization. Support team is the sharpest I have had, they know their stuff! Cons: Can't think of anything major, possibly more programs to integrate with. Overall: I own a electrical, plumbing & HVAC company, and have tried all the major Field service programs, and always ran into issues with lack of reporting. Anyone in this industry can agree that reports are very valuable, and very hard to get what you need from a program. Recommendations to other buyers: Dream it up, then ask them to make it happen, they do what others dont even think is possible. Cons: Needs tweaking and customizing, frequent scrutiny for accuracy. 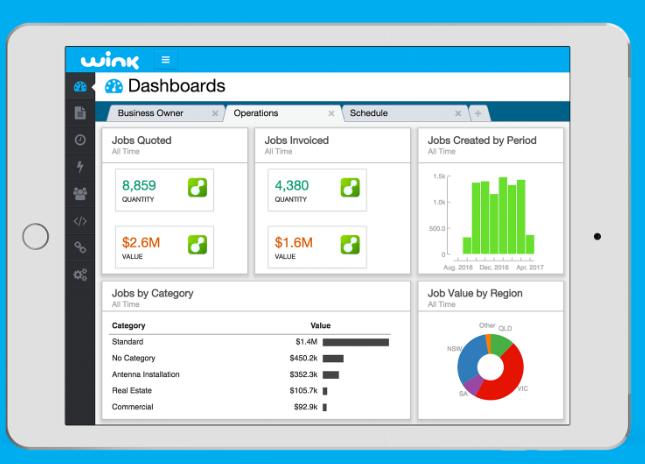 Overall: The team behind Wink Reports has done such a fantastic job with this product. Comments: We approached Wink Reports about 6 months ago as we needed some advanced information to be pulled out of ServiceM8 for an existing client. Within a couple of days of submitting the initial inquiry, they came back with a working example and gave us the exact data we needed. The speed at which they completed the work, and the constant and direct communication we had with Andrei was absolutely awesome. We instantly saw the benefits of our businesses working together, and are working on developing this further in the future. Comments: Easy company to deal with, great customer service and a very good product. Very easy to deal with sales and technical.